Instead, India’s state-owned missile maker Bharat Dynamics Ltd (BDL) has already been enlisted to tool up for the Astra. The idea is that by the time the IAF is ready to place bulk orders for the missile beyond the 50 already contracted, a warm production line would have been progressively debugged and ready to churn out Astras on or ahead of schedule. “This is to ensure the production line is created quickly so that the final series production Astra comes out without any flaws. The 50 missile order is currently being serviced,” Christopher said. The Indian Air Force will conduct further tests of the Astra this year and the next as part of a user trial phase before it commits to orders of the final Astra missile. DRDO expects such an order to be in the hundreds, given that the Astra will arm not just the IAF’s Su-30 MKI, but also its upgraded MiG-29s, LCA Tejas and other platforms. This is good to hear. People discount the real facts when it comes to building a defense industry but from my chair there are a couple of issues to over come. The first are the interests of those that want to sell you weapons. They'll sell damn near everything but tech transfers are limited...even with Russian or Chinese weapons. Next is the fact that it takes time. The Chinese got supercharged because of idiotic US foreign policy and the greed of our manufacturers. If they weren't "assisted" in the advancement of their industry then they would be BEHIND the Indians today. They were in just that bad shape before Bush-Clinton saved them by opening the door to our markets for stuff manufactured there. Last there is the usual domestic stuff. Guns or better debates. It's all a balancing act and while I find covering India's defense industry/procurement to be frustrating it's also understandable. Additionally while I have at time criticized them when they've failed, its only right to cheer when they get it right. 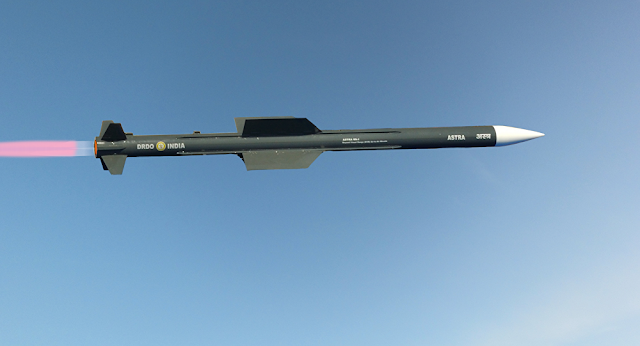 The ASTRA air to air missile seems to be something to cheer about....next I want to see if version 2 can actually come close to meeting Meteor performance...they do that and they'll have cracked the code!